On a recent trip to France, I managed to achieve a long held ambition to visit 53 Rue Victor Hugo, Levallois-Perret, Paris, the shop of constructeur Cycles Alex Singer. The shop is located in the suburbs of Paris beyond the Boulevard Périphérique. As it is not located in the centre of Paris, I was apprehensive about travelling there. In reality it was easy. I checked information on the web before travelling and read all the dire warnings about using the SNCF Transilien suburban service, as being complicated. In actual fact, I didn't find that at all. The RER train ticket can be bought from one of the automated ticket machines, which offer English and Spanish language, by touching the appropriate flag on the touch screen. Once you have purchased your ticket, follow the signs to the platforms. The RER station at Gare du Nord is called Magenta. You need to take the train for Haussmann-St Lazare for the Gare St Lazare. The return train to Magenta, is the service to Tournan en Brie. You will need to check the TV information display screens on the platforms. They will tell you the direction of travel, time of trains and most importantly, the platform the train will use. If you are travelling early in the morning, be warned, this service is heavily used by commuters. The fact the carriages are double deck should give you an idea of how much this service is used. Once you arrive at Haussmann-St Lazare, follow the signs from the platform for the Gare St Lazare (trains) which will bring you into a shopping concourse. SNCF have a ticket office in this concourse. There is also an information office on the same floor near the station door and second one on the platform concourse upstairs. You will need to go to this upper level and turn right to get onto the main station concourse area leading to the platforms. 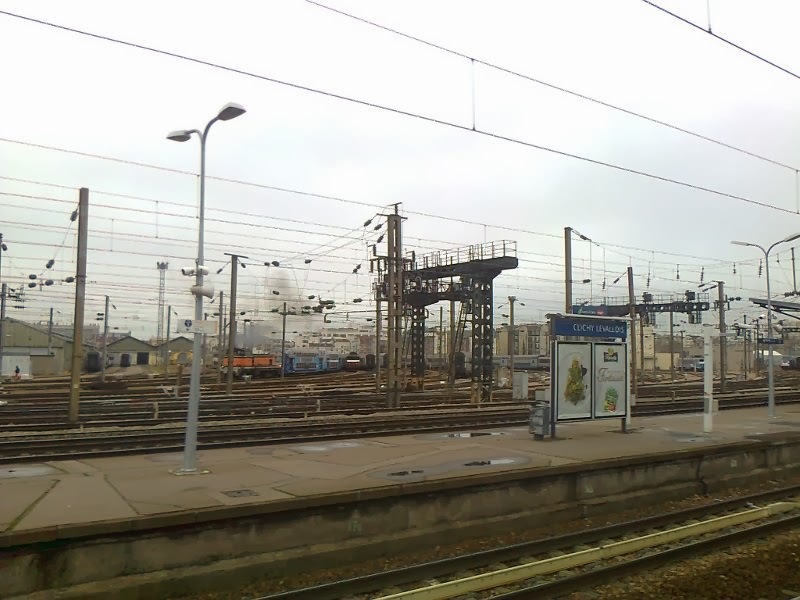 There is a regular 10 min train service to the Clichy-Levallois train station. The train service you need is the Nanterre University train, which usually leaves platform 7 or 8. Again you need to check the TV screen for train information, which will give you the departure time and platform the train is leaving from. Clichy-Levallois station is the second stop out from Gare St Lazare. The station entrance is under a railway bridge and you will need to turn left, to go out onto road which leads to the Rue Victor Hugo. Follow this road to the Rue Victor Hugo and turn left again. Walk down the street. The shop is located down the street on the right hand side. You can find a detailed map of the area of Paris on Google maps. If you scope down to the Rue Victor Hugo and the station details, print it and take it with you for reference, you can't go wrong. When I arrived on a Tuesday lunchtime, the shop was still closed. I had to wait until 14:00 hrs for the shop to open. The interesting thing about using the train in Paris is the chance to have a look at all the bikes parked in the bike racks at the stations. I took a few photos of the one outside Gare du Nord on the Rue de Dunkerque. Quite a few mixte bikes, Motobecane and Peugeot. I also spotted a Roger Riviere bike which I grabbed a photo of. What is striking when compared to Ireland is the complete absence of carbon. While cycle shops in Ireland seem to be wedded to selling carbon for every kind of use, the French are much more practical and pragmatic. Steel bikes are much in evidence and in use as a practical means of transport. What else can you expect from a great cycling nation?